Back in the Day | Small, but valuable. You know how great it is to walk into a coffee shop and smell delicious coffee roasting? I love that, especially as the weather starts to cool down and things feel almost fall-ish. The only sad thing is that my take on the “good coffee smell” changed a lot right after college. I worked at Borders for three or so months while I was settling into life after college. I spent two of my months there as a cafe worker, learning how to make espresso drinks and giant pots of drip coffee, and it was for the most part a good experience. The only long-term negative from that job is the coffee smell association thing. I still get warm fuzzies when I walk into a coffee shop, but if I smell like coffee when I walk out of the shop, I instantly feel gross, like I just finished a long shift at the cafe. Those shifts usually ended around 11 PM, so getting home from work after that isn’t something I want to relive every time I get a cup of warm coffee. Hmm. I think I’ll just have to limit my coffee shop time to 10 minutes or less. It could work. Coming soon: pictures of Scott’s birthday cake, stories of said birthday, and lots of other random stuff. As I type this, I’m drinking out of a 2-liter Coke Zero bottle. You’ll see why that’s relevant in a minute. I don’t know what made me so happy about that. It’s just so specific and so true. Well said, Scott. During my sophomore year of college, I lived on cafeteria pizza, pop tarts, and doughnuts with the occasional veggie-filled sandwich thrown in. Now I live on frozen pizza, cereal, store brand Easy Mac, and the occasional delicious, semi-healthy meal. (I had the best salad ever on Monday night–a huge plate of baby spinach with warm goat cheese, caramelized walnuts, and tomatoes on top.) Breakfast and lunch today consisted of cold cinnamon raisin bread. What I can say with pride is that I no longer eat like I did in grad school. There was a Hot Pockets phase around then, which Jim Gaffigan might have shamed me out of ever repeating. At this point, it’s probably time that I raise the standard from “no more Hot Pockets” to actually cooking real food even if I’m the only one eating it. Probably. I’m revamping the “About” section of the blog day, so check it out and pretend it’s another post if you’d like. It will be a couple of hours between this moment and the moment when anything is changed there, however. Patience, grasshopper. And now for the promised You’ve Got Mail moment. That’s one of my all-time favorite chick flicks. If you missed Meg Ryan mania in the 90’s, the movie is about a cute-if-slightly-bookish New Yorker who often feels insignificant and wonders what she’s doing with her life. She runs a bookstore that her mother ran before her, and her life is turned upside down (just like the Fresh Prince) when a Barnes & Noble-ish store opens down the street from her. Joe Fox: Don’t you love New York in the fall? It makes me wanna buy school supplies. I would send you a bouquet of newly sharpened pencils if I knew your name and address. After which my inner dork sighs. I was one of those kids who couldn’t wait to start school every year. Whether I was homeschooled or went to “real” school, I couldn’t contain the joy of having a fresh, blank notebook and a few new pens. I organized my supplies just so in my bag or on my desk, and I waited anxiously for that first day. Books and friends and more books were waiting for me just around the corner. There were tests to conquer, hours and hours of solid procrastination to cram in, and all sorts of other unexpected happiness to come. A friend did send me a bunch of new pencils when I started grad school, and it was one of the best care packages I’ve ever received (Yours are great, too, Mom!). There’s something about fresh school supplies that will always take me back to those moments when I couldn’t wait to go back to school. School wasn’t about pressure or success then. It was about a new year, doing the best you could, and reading a trillion books. It was good. In 10.5 short hours, my best friend from high school will show up on my doorstep, and I’ll be transported to the mental state of a seventeen year-old. I’m pretty excited about that. It’s not that I want to be excessively giggly or dramatic, which I think we both avoided fairly well for teenage girls. It’s just that old friends are great. They knew what you were like before you knew what you were like, and they decided to keep caring about you anyway. If a thought passed through my head in high school, she knew about it. Even if I meant to keep something to myself, it inevitably spilled out in late-night conversations on the trampoline behind her house. Who knows how many hours we spent looking for shooting stars back there while we talked about life. Not many of my seventeen year-old thoughts were worth sharing, but she never told me they didn’t matter. Looking back, I wonder how we didn’t run out of things to say. We went to the same classes, ate lunch at the same table, played most of the same sports, and hung out with the same friends. And somehow, we never even got close to the end of a conversation. Isn’t it strange how certain smells and sounds and even songs can conjure up the same memory every time you run into them? The smell of boxwood plants always reminds me of eating watermelon in the summer at my great uncle’s farmhouse. I’m seven years old again every time I smell them. For the past few weeks, I’ve heard this new song on the radio here and there. Then it appeared on my iPod and the run-ins became more frequent. Imagine that. The song in question is by The Band Perry, and it’s called If I Die Young. It doesn’t sound cheery, I know. It is really pretty though, and the memory that it brings up is a scene from a favorite childhood book/movie–Anne of Green Gables. Anne is dramatic, to say the least. In the scene in question, she’s floating around a lake, pretending to be Alfred, Lord Tennyson’s Lady of Shalott, who floats down the river to find her love and dies on the way. The song covers the same subject matter in a different order (death before floating away), and we’ll just say that I’m not doing it justice with this description. It’s not creepy, I promise. The beauty of having this current song that reminds me of Anne is that now something I loved back in the day has a 2010 milestone in my brain. In addition to being an important part of my past and a classic literary figure, Anne is the source of one of my favorite single-girl quotes. She’s talking about the fact that her best friend’s fiance is just too good. When asked if she would rather marry a wicked man, Anne responds, “Well, I wouldn’t marry anyone who was really wicked, but I think I’d like it if he could be wicked and wouldn’t.” Exactly. So with the help of The Band Perry, it’s nice to add Anne and all of her wisdom to a niche of my grown-up memories. P.S. After writing this, I did some research and found out that the music video for If I Die Young directly references The Lady of Shalott. That made me happy. Picking up a friend’s mail this week (he’s out of town, I’m not stealing mail or anything) has reminded me of some other house-sitting-ish experiences from my past, so let me take you back to 2006, when a young me was living on her own for the first time. 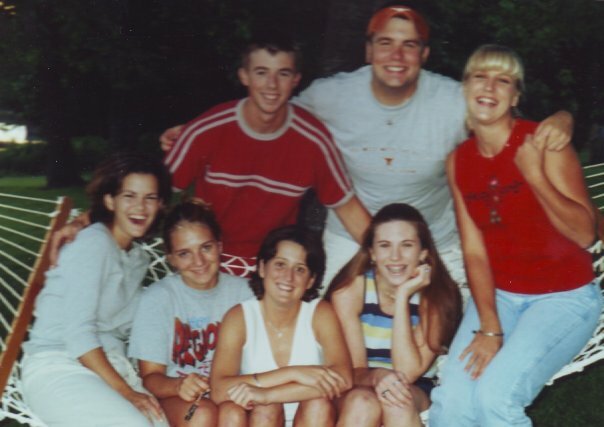 This was post-college, pre-Peanut, and I had recently moved across the country without knowing a soul. That left my social calendar wide open. I was a prime candidate for babysitting, house-sitting and/or dog-sitting, and I got a fair number of requests along those lines. Of all the pets I spent time with that year, my favorite by far belonged to my landlords. His name was Henry, and he was an old terrier who the landlords rescued from a shelter several years before I met them. In fact, Henry used to live in my apartment before the daughter of the house existed and before the couple was a couple. He was abused at some point in his pre-landlord history, so he was shy. The landlords wanted me to stay with Henry at night so he wouldn’t be alone so much, and I gladly accommodated. Everything went smoothly until I climbed into bed on the first night of the job and was followed immediately by Henry. I never would have dreamed of letting a dog sleep in my bed! A look of shock registered on my face, but Henry didn’t notice. He seemed pretty used to the situation, so I thought I would go with it. And if I didn’t already love him at that point, Henry won me over by placing one of his front paws lightly on my leg. He moved a little each time I moved a little, and his paw stayed on my leg all night. He just wanted to make sure I was there. It was pretty much the cutest thing I had ever seen. So that covers Henry. He was my standard for best dog until Peanut burst into my life. Peanut isn’t shy, and that’s another story. Because I liked Claude from the first note, I wrote back. Claude thought I would care how his morning went and how Henry felt two hours before I got home to him, and I did. He also assumed I would like strawberry shortcake and left the ingredients for me in the fridge. Right again. We never wrote about anything significant, but those letters still made me feel connected to a local family in a way that was really rare at that point in my life. I have those letters stashed away in a file somewhere. I never did meet Claude, and it’s been three years since I’ve seen Henry’s cute mug, but they still have a special place in my heart.